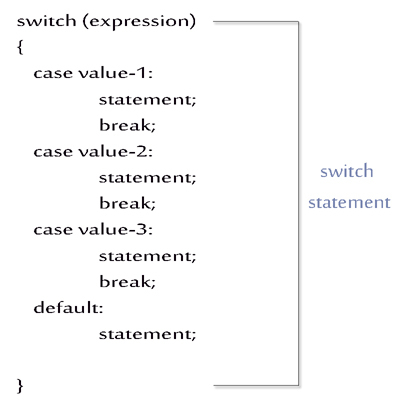 C++ language provides a multiple branching statement called switch, which contains multiple cases, where each case has a value. The value inside the parenthesis of switch statement expression is tested for equality against the value of each case. The case having a value matching to the value of switch, is executed. The case with the value matching to the value within parenthesis of Switch, is executed. As the break statement is found after the matching case value 2 hence, the control has not executed any statement connected to any cases underneath. If no matching case value is found then statement connected to the default case is executed, only if default case is mentioned with the default keyword. Note : A break statement after each case is not mandatory. If the matching case is found but there is no break statement connected to it then control will execute all the statements connected to the all cases underneath it.